DT: The way you captured the city of Cairo was fantastic, but beyond that, the images were incredibly beautiful in their own right. In the film, your characters talk about the act of shooting Cairo. What was your guiding principle in deciding what images to capture? TES: I always find that when there is something in reality that is superstrong and intense and full of emotions and we try to capture it and put it on a big screen, we lose something. I wondered a lot about the process of capturing the image, because when we try to interfere too much, it changes the soul or the spirit of what we are trying to capture. Cairo is a very big city. It’s full of contradictions. It has its own rhythm—if you try to impose something on it, the city will reject it and won’t allow you to. When I started to film Cairo, I was trying to take the lead, but soon enough I realized that this was not possible. I can’t make a city follow me, so the approach I took was to surrender to the city and allow it to take the upper hand and carry on. I was just there to see what the city gave me and try to build on it. It’s a very fine line, a very minor difference between following the city or making the city follow you, but it’s also a lesson about how you deal with your ego. Would you like to impose yourself on the city, or do you want the city to give you part of itself? If you want the city to give you its soul, you need to be patient and accept the rhythm that the city creates. Basically the idea was to use the city as a backdrop without interfering at all, allowing the actors to be part of this scene and creating a room for improvisation and interaction that happens between the city and the actors, and to allow ourselves to have this freedom to dance with the city. I didn’t have an image in my head that I wanted to create. It’s about what the city proposed, and I built on it. DT: The demolition sequence in Alexandria was particularly moving. What did you want to achieve there? It’s not about the steel; they don’t allow her to keep this memory. It’s like hijacking the memory of this woman, and in a way it’s hijacking the collective memory of ourselves. And then the city itself is losing what gives it a certain character. For me this goes with everything. The film is about someone who is trying to be connected to his hometown, to his city. He starts to capture something, and the more he goes through his past, the more he realizes how he is a stranger in his hometown. At one point he feels like even physically the city is demolishing. This is part of the overall feeling that we had back in those years, in 2006, 2007, 2008, and 2009, when we were thinking something big was coming but didn’t know what it was exactly. You have very mixed feelings toward it because you feel we cannot carry on like this but you also don’t know what’s coming, and because you don’t know what’s coming, you’re also very scared of this thing happening. Because from one side it might become a new beginning, but from the other side it might take with it everything you love, and maybe it will bring something even worse. This is exactly what the film is about: what does it mean to feel that the world around you is changing and you don’t have a chance, you have nothing to do with it, and you only have a camera? How do you interact with this? DT: You talk about the uncertainty of the future and its effect on the present, but you also feel the vast weight of history and its effect on the present. You essentially have the present being pulled from both sides. TES: For sure. For me what makes Khaled a cinematic character is the fact that he has a very heavy past that he cannot carry on his shoulders anymore. He lives in a very suffocating present and cannot see a future. Every time he tries to find an exit for himself, it’s blocked, wherever he goes. This is also something related to my generation growing up in this part of the world. It took me a long time to understand that life is not like this. Why do we always have to pay this very high price of losing people we love, of always feeling threatened in our hometowns and feeling so connected and disconnected at the same time. This is something that comes from a very long history, which, on the individual level and on the collective level, is making our present very suffocating. DT: In that sense is Khaled a metaphor for what’s happening in the Arab world today? TES: Of course there’s a level of self-reflection, and when I’m saying self-reflection, the theme also includes all these questions about my role toward everything that is happening around me. What is my role as a filmmaker, and what is my role as a citizen? Also what is my role as someone who is part of the people who are making art in the bigger scene? 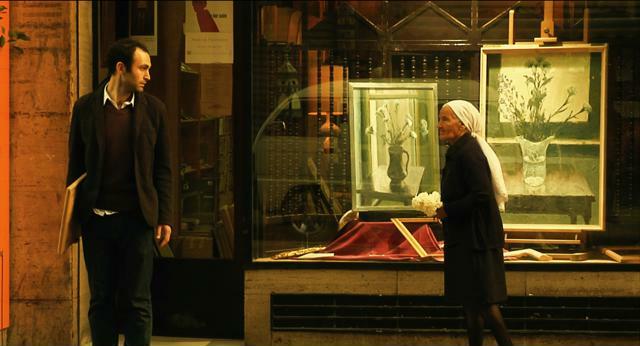 Khaled’s arc in the film is about him understanding that he himself is part of his problems. It’s also questioning his positions in many situations, his passive reactions toward many things around him. His incapacity to interfere with everything happening around him, like when he filmed the man beating the woman on the rooftop. It’s not only about domestic violence; there’s also a class issue here. He is able to film them because he’s living in his house and they live on the roof and he can see them from this high angle. There’s another question: Is he allowed to film them? And was it more important to film them or to interfere and stop this domestic violence from happening? This happens in different places in the film, like when he sees the demonstrators but doesn’t attend the demonstration. All these things are also questioning our responsibility toward what’s happening around us. This is definitely a part of how I was thinking of the film. DT: I loved the part about Abdel Halim Hafez, the famous Egyptian singer. What was that all about? TES: It happened to me when I was a kid. My father was working on this radio program and one day he took me with him to the station. That day we met Abdel Halim Hafez in the elevator. It marked my life, of course, because he was a very famous star. At the time, there were no video cameras yet, so people either used super 8 cameras or made tape recordings to preserve their memories. While making the film, I found a tape from my childhood my father and I made the day we met Abdel Hafim Hafez, where my father was asking me, “What did we do today and who did we meet and where did we go?” I decided to use this tape, but redoing it with my actors, just to have his name in the film. DT: The film took ten years to make. Why so long? TES: There are many reasons. First of all, you have to confront the difficulty of making such a film in this region. There’s no infrastructure, and there’s no production model that allows such a film to be done. In a way the film had to build its own infrastructure and create a new production model that would allow us to do the film the way we wanted. When you ask, “Why so long?” I would say that over these ten years I was a filmmaker for only a few days. Most of this ten years was consumed, and taken, and spent with building up [a context that would] allow these few days to happen. Without building this infrastructure, without setting up the conditions that allowed us to make the film the way we wanted, it would have been impossible to make the film. This was a huge, huge, huge battle that was bigger than the film. We did the film without having a reference to follow, creating a production model of the film while we were making the film itself, in every aspect of the production. On another level, we didn’t want to make any compromises on our standards. We needed to make good sound, good image, good postproduction that allowed this image and sound to meld; on this level compromise was not really possible. 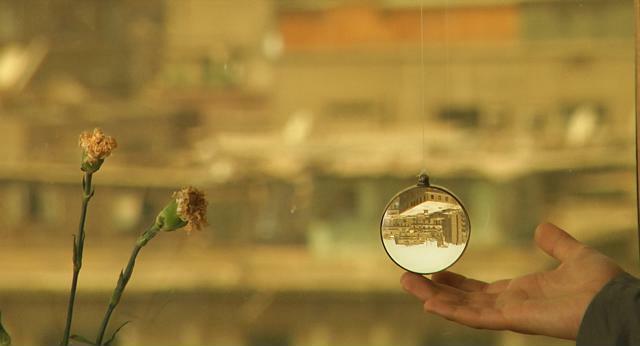 In this film, which is about a big city like Cairo, the film has to stand as big as the city. That was another challenge that took a lot of time. I also wanted to work with people who could add something to the film, and that too was very difficult to find. My crew came from more than ten countries, without having any budget for them. When you look at the credits it seems like we had a big, big production, but actually the budget of the film was very, very, very small compared to similar films. So if you don’t have the money, then time is the price, because you have to do everything yourself or with very few people. And then there was another thing. In the middle of this ten years there was a big revolution in my country, which changed the whole equation again. For example, I couldn’t work at all. I wanted to be part of this moment, not as a filmmaker but as a citizen. I thought, This doesn’t happen every day that my home country is changing. I was so lucky to witness this in my life, and I wanted to be part of it. I’m a first-time filmmaker, I’m a first-time producer, and I made all the mistakes that you can imagine for a first-time filmmaker/producer, but that was also the only choice I had, because no one agreed to produce the film because no one believed I could deliver it. DT: In the 1940s and 50s, Egyptian movies were the height of Arab cinema. What happened? 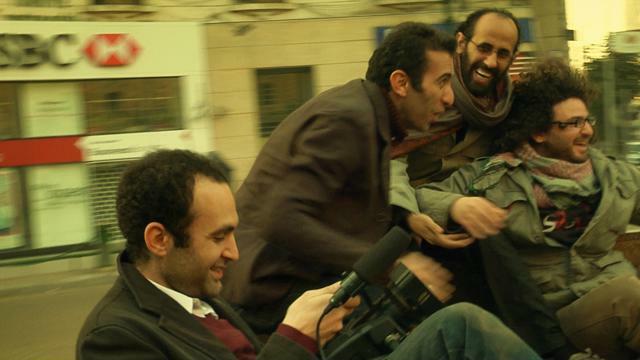 Or to put it in other words, what is the state of Egyptian cinema today? TES: To answer this question needs a thesis, but I will try to explain. What happened is basically that Egyptian cinema is a big industry, and because it’s a big industry it doesn’t accept any voice out of the mainstream, so this marginalized independent cinema doesn’t exist anymore. There is no infrastructure for it. Over the years, the state preferred to control everything, so there is no room for independent filmmaking to exist. The laws, the structure of the industry, and these big companies create a monopoly controlling the whole scene. Someone like me and a few others who are trying to make a cinema outside of this mainstream are not welcome. On any level. At the same time, thanks to the new technology, this medium of filmmaking has become more democratized and allows many people to make their dreams come true and make new films. This is what happened with me and many others—we benefit from the new technology, which makes equipment cheap. This is not an easy option, because a lot of control comes from state censorship, which doesn’t allow us to feel things the way we do. This is a broader picture of how the situation is today. On the other side, I’m very optimistic about the future of Egyptian cinema because I can see a new generation of many filmmakers who have a very different approach to the reality of today. These filmmakers are increasing every day, and they find a way to support each other and make new films. They are making their films outside of the mainstream, and they don’t want to wait. They want to capture this reality in a different way and present it to the world, so I’m actually very optimistic. Tagged Arab cinema, Arab spring, Big World Pictures, Cairo, Egypt, Egyptian cinema, In the Last Days of the City, Khalid Abdalla, Tamer El Said. Bookmark the permalink.